If you play lacrosse, you need lacrosse specific cleats. Because lacrosse is a sport that requires footwear and shoes that allows cuts, dodges, jumping, sprinting and shooting. And we've got just the thing! 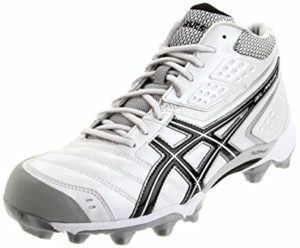 Complete reviews of the best lacrosse cleats for both guys and girls. In lacrosse you need specialized cleats with a focus on speed, agility, and toughness that are becoming more popular in today’s game. Though generic lax cleats made by all big-name shoe dealers can be purchased and meet your expectations, you can also find specific mens and womens lacrosse cleats that will help you take your game to the next level. Sometimes soccer or football cleats will do, but we highly recommend investing in a pair of lacrosse specific cleats. Just with Lacrosse helmets, your lacrosse cleats can make a statement on the field! 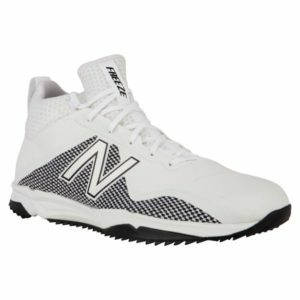 You can find a variety of of both mens and womens lacrosse cleats on the market, from more expensive custom lacrosse cleats, to cheap lacrosse cleats. When looking for new lacrosse cleats, you are going to be hard pressed to find the best lacrosse cleats available, because every player’s foot is different. There are certain things you can be aware of when buying a new pair though. 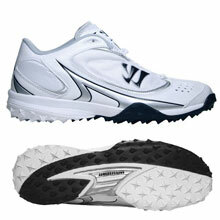 For example, do you want lacrosse turf shoes?! Read on to find out! 1. Getting the Best Lacrosse Cleat Height: High, Mid, or Low? Choosing between high, mid, or low lacrosse cleats is totally personal preference. Support should be key in a lacrosse cleat if you struggle with ankle injuries. High-top lacrosse cleats can help reduce your risk of ankle sprains while not compromising your ability to cut, run, or pivot. Mid-cut cleats are the go-between of support and flexibility. Not only to the offer added protection to your ankle to help prevent rolling, but they aren’t cut as high as the high-top cleats, so if you can’t get over the feel of the high-top but want some added protection, try the mid-tops. Low-tops offer the most ankle motion and are the lightest, since there is less material. Preference is key in buying a new pair of lacrosse cleats, but don’t be afraid to try something new! Most high-top lacrosse cleats are designed with protection of the ankle in mind. The laces and heel of the shoe come well over the top of the foot and just under the calf in order to offer you stability to your ankle. 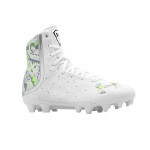 High top lacrosse cleats are best for those players with chronic ankle sprains. 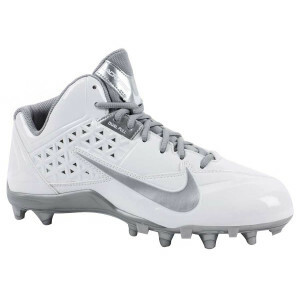 Depending on your preference, you could also buy mid-height lax cleats. These cleats come just above your ankle, still giving you support, but not wrapping well up your shin like high cleats. Go with low lacrosse cleats if you're used to playing soccer, or don't suffer from any ankle issues. I personally have never had ankle injury issues, and prefer the lightweight and flexibility that low cleats give. Again, totally personal preference. Try some on and see what works for you! Lacrosse cleats should be lightweight and streamlined to your liking. Big, bulky cleats are a thing of the past, and lacrosse-specific cleats are lighter and more adapt to your agility than ever. Lacrosse specific cleats can help you play at the highest pace you can. Now we all know that throughout the lacrosse season, there will be mud, rain, and maybe even some snow, depending on where you live! You want to make sure your lacrosse cleats repel or resist water, or are made from a material where water and snow won’t soak through. There is nothing worse than playing an entire game with soggy lacrosse cleats. 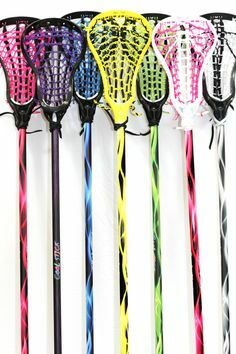 Most lacrosse cleats for girls or guys are made with a synthetic outer material in order to keep your feet dry and warm. Make sure that if you buy new lacrosse cleats that have water resistant material, that you aren’t sacrificing speed. Heavy lacrosse cleats can do nothing but take speed and agility away from your game! 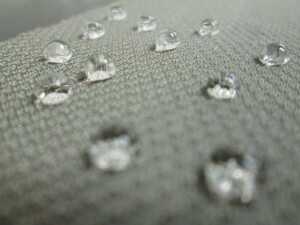 Lightweight materials include leather and synthetics. Both are water resistant, breathable, and offer support but not stiffness. Foam padded and other materials like to hold in water, which gives you that terrible “squishy” feeling throughout the game. 3. Lacrosse Cleats Stiffness: How Loose is Too Loose? Cleats should be durable, lasting you throughout the season. No one likes a lacrosse cleat that rips half way through the season because you cut too hard and too fast. Get cleats that can keep up with your game! Both mens and womens lacrosse cleats as of late have been designed with the foot in mind. 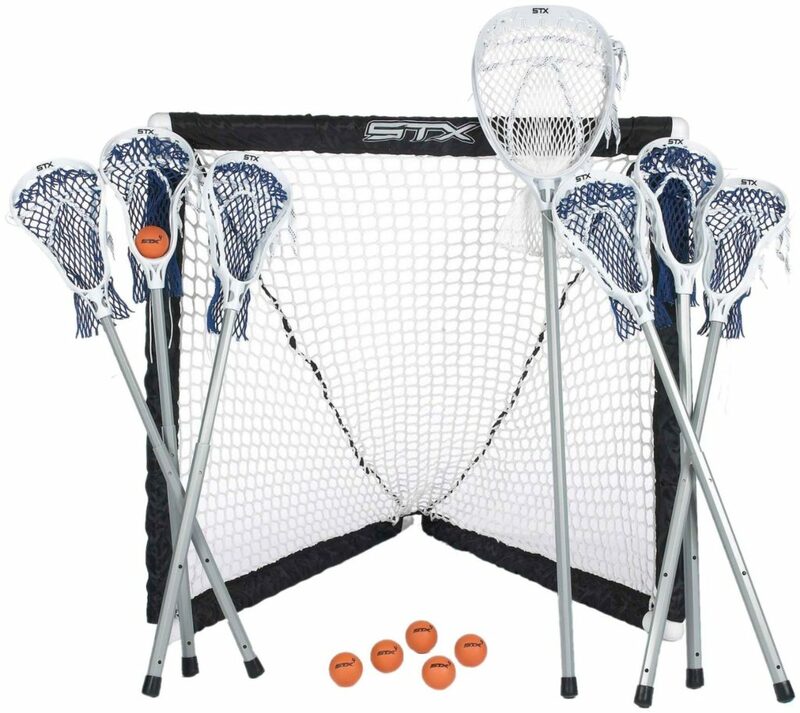 Both boys and girls lacrosse depends on fast cuts and plenty of lateral movement. The ability to plant, twist, and cut in a split second is what the sport of lacrosse is all about. Having lax cleats that will offer you support and stability without losing speed is essential. Most new lacrosse cleats are fit with a plated outsole on the bottom of the shoe. This outsole plate offers maximum support with enough flex as to not burden your stride while running or cutting. Like many free designed lacrosse sneakers and running shoes, you should not be able to bend your cleat in half. Being able to do so shows that the cleat offers little to no midfoot stiffness. This can contribute to sore, tired feet halfway through the lacrosse game. When choosing new mens or womens lacrosse cleats you will have an option to buy traditional molded lacrosse cleats or lacrosse turf shoes. Both are designed to give you maximum traction on the lax field. You should get a lacrosse cleat or turf shoe that is better for your game. If you play solely on turf, get lacrosse turf shoes. They are designed with numbs that bite at the turf to increase your traction, whereas cleats are designed with molded tips that dig much deeper into the ground for added traction in mud and wet conditions. 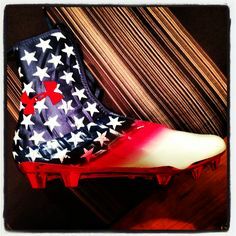 If you live in parts of the country that have wet, snowy, and rainy conditions for the majority of the season, make sure to invest in a water resistant lacrosse cleat or turf shoe as well. Traditional molded lax cleats are best for grass, but you can also wear them on turf. Molded lax cleats usually have four pegs on the heel of the shoe, and an additional six to ten on the forefoot. Molded lacrosse cleats will help you dig into muddy grass and waterlogged fields. Though molded lax cleats will also provide you with traction on turf, they can also make you feel a little unsteady on wet turf. Players who spend most of their season practicing and playing on lax turf would do better with a pair of turf lacrosse shoes. 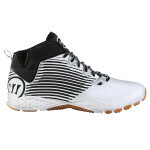 Turf lacrosse shoes will give you traction on both wet and dry turf, and even dry grass. Different than molded cleats, lacrosse turf shoes have a rigid serrated-like pattern on the sole. The grip comes from the little nubs cut from the bottom of the shoe. Usually rubber, the turf shoes offer grip and flex. Most lacrosse cleats fit true to size, but it helps to know what size you are normally in that type of shoe. If your old mens or womens lacrosse cleats were too small, you want to bump it up half a size. Rule of thumb, you want half an inch between your big toe and second toe so your toes don’t rub or jam into the shoe when planting and stopping. Some lacrosse cleats also are equipped with reinforced shoelace holes so you don’t tear at the material after tightening them up game after game. All of these factors will come into play when buying the best lacrosse cleats. There is a huge variety of color and style of lacrosse cleats for girls or guys, so you’re more than likely to find the perfect pair of cleats in your team’s color anywhere online. 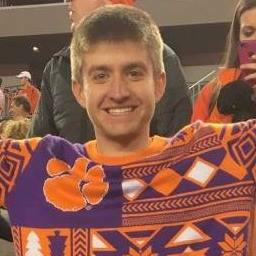 Different brands of lacrosse cleats are more popular than others, and that’s because of the reputation of the brand with other equipment. A review of each of the brands offering lacrosse cleats can give you a better idea of exactly what type of lax cleat you should look for. Piggybacking off of the New Balance Freeze lacrosse turf shoe is also the New Balance Freeze lacrosse cleat. 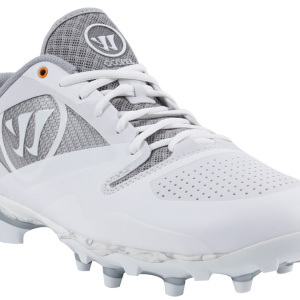 This lacrosse cleat is created similarly to the turf shoe in that it has a synthetic bottom, but with TPU molded cleats instead of nubs for turf. The New Balance Freeze V1 lacrosse cleat is created with Quixrail technology, which is strengthened “X” pattern at the midfoot that mirrors lateral movements created by the player. Players rave about their comfort and durability. The snug fit supports the foot, but lets you move and run naturally. For $$, you can get these New balance Freeze lacrosse cleats in primary colors like red, blue, black, and white. The Under Armour Highlight MC is the adult version of the Highlight Jr, for all of the older players that play the game. This hightop lacrosse clear is made of a synthetic material that is designed to give you support while running, yet offer you flexibility of sharp cuts and lateral movements. The footbed is created with 4D foam, to mold around your foot for optimal cushioning. Even cooler, the toe is created with V56 technology, designed to prevent injuries like turf toe. This Under Armour lacrosse cleat will offer a next-level element to your game for anywhere from $-$$. New Balance created a mean lacrosse turf shoe. 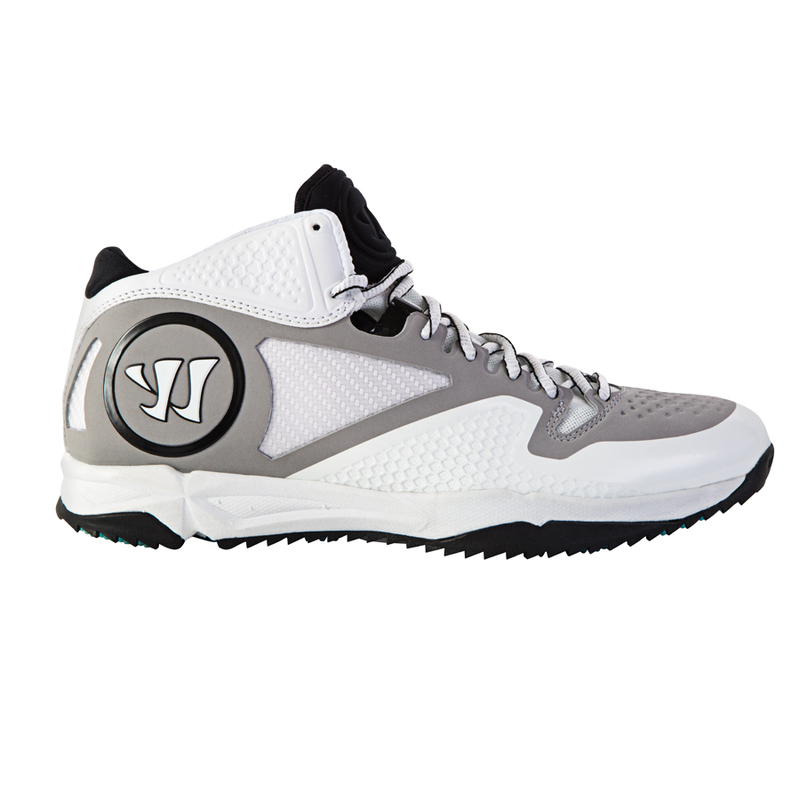 Specifically designed for lacrosse, the balance between strength and weight is perfect for the player looking to cut on a dime without being weighed down by more bulky and restrictive shoes. The New Balance Freeze Lacrosse Turf Shoe has a nubby turf bottom to give you traction without sinking too deep into the turf itself. This lacrosse turf shoe has a synthetic upper and sole, to provide a water resistant outer layer to protect your feet from rain and snow. Priced at about $, if you play exclusively on turf, this is your shoe. You don’t hear much about Asics in the lacrosse game, but these GEL-provost mid-top lacrosse cleats are getting great reviews from players. Asics is one of the more supportive shoemakers in the game. The mid-top collar height supports the ankle but does not compromise flexibility or performance. The lacrosse shoe itself is smart, it’s created with a 10mm heel to toe gradient that puts the athlete in a biomechanically correct position to perform. The Asics GEL-Provost Mid lacrosse cleat is lightweight and comfortable, created with cushioning that will keep your feet cushioned and protected throughout the game. 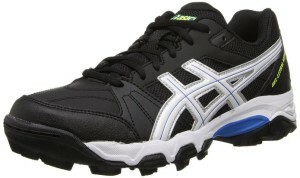 These Asics lacrosse cleats can be found for $-$$, depending on your size and style. 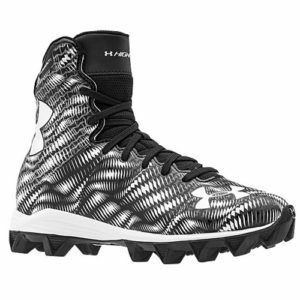 The Under Armour Banshee Mid MC lacrosse cleat is the best in the mid-top cleat game. Mid-top lacrosse cleats are perfect for those players that just can’t get into the hightop game, but want a lacrosse cleat that is a little more supportive than a low-top. The supportive CompFit collar designed by UnderArmour cuts around the back of the ankle, allowing more motion than a hightop. This Banshee lacrosse cleat is designed with the 4D foam footbed, a signature of Under Armour. The footplate is molded, bladed cleats that allow for the best traction in the game. 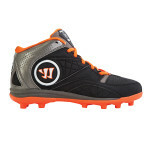 Players love their comfort, and these lacrosse cleats are a great buy for anywhere from $-$$, depending on the color. 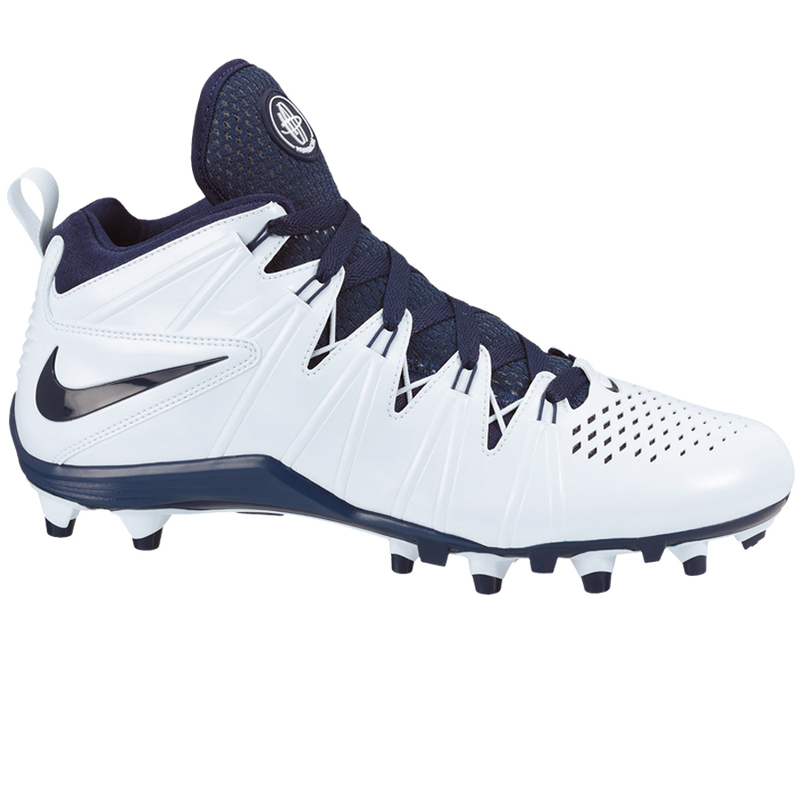 The Nike Speedlax lacrosse cleats are tried and true for many lacrosse players. 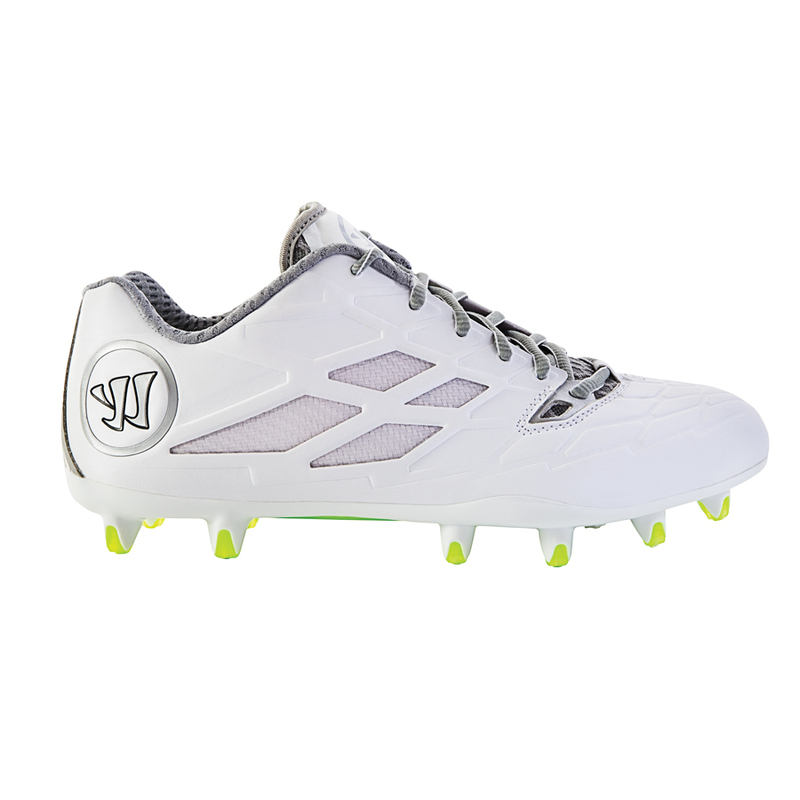 Created to be lightweight, the Speedlax cleats are made from synthetic leather that is supportive and sturdy. The low profile of the Speed Lax cleats gets rid of unnecessary bulk and helps you have a more natural feel while running, because this lacrosse cleat also have a fit sleeve, which slides over your midfoot to really grip while running and cutting. You can find these Nike Vapor Speedlax cleats in a few different primary colors, so it’s a little easier to match them to your school or club teams’ colors than some other cleats may be. 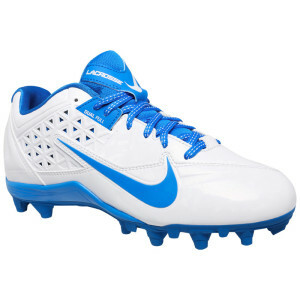 Depending on the color or size, you can get these lacrosse cleats for under $. The Nike Huarache cleats are one of the most iconic lax cleats in the sport. Fully equipped with the lightweight leather upper for comfort and durability. Also the Flywire technology for lockdown and lightweight support. A 3/4-length wedge Phylon midsole for midfoot cushioning and support. Super Low-profile forefoot for optimal feel and responsiveness. Added TPU outsole for lightweight traction and control for these Huarache lax cleats. You probably see more and more players wearing hightop lacrosse cleats, and for a reason. Hightop lacrosse cleats are not only becoming more comfortable, but they are also great for protecting your ankles from injury, like ankle sprains. These Under Armour Highlight Jr. lacrosse cleats are designed to offer flexibility and stability all in one. The rubber molded cleats offer traction and durability on grass or turf. The hightops extend upward above your ankle and wraps your foot in a comfortable layer of Under Armour’s signature Clutchfit material, which is dynamic for cutting and pivoting. 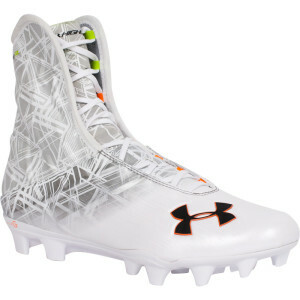 Coming in junior sizes, this Under Armour Highlight lacrosse cleat will run you about $55. 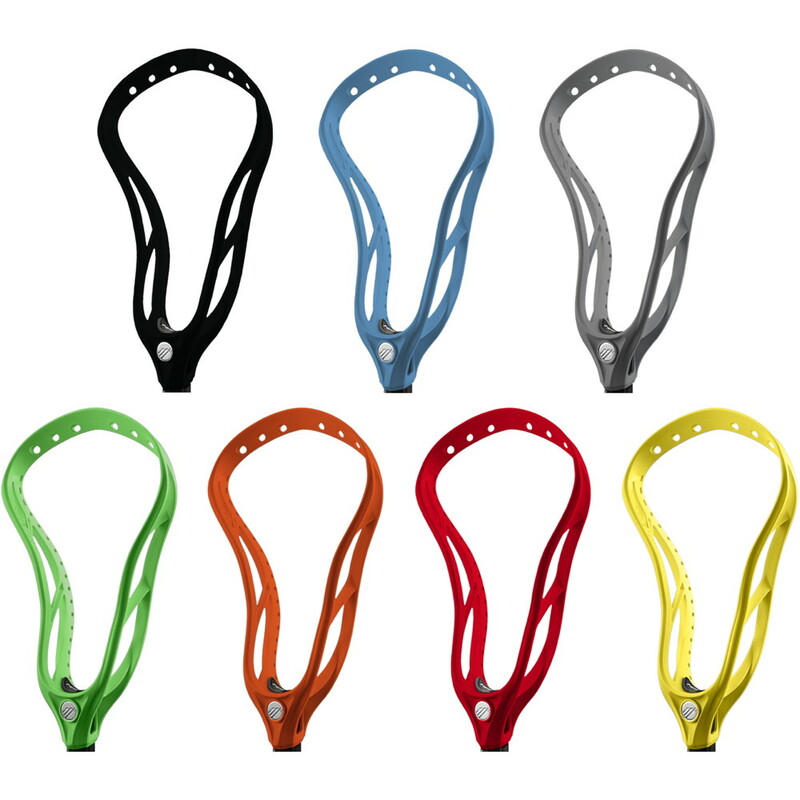 Brine lacrosse cleats, Nike lacrosse cleats and Under Armour lacrosse cleats are the most common brands purchased. All three companies make women and girls specific lacrosse cleats. They all boast a form-fitting tough exterior made of synthetic materials, with a dynamic grip that aids your explosive movements. Like the men’s version of the Under Armour Highlight lacrosse cleats, the women’s Highlight lacrosse cleats are light and streamlined to add to the finesse of the women’s game. The supportive ankle allows you to maintain your speed without being dragged down by a heavy shoe. 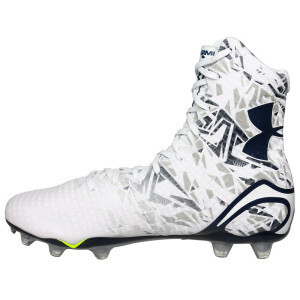 These Under Armour women’s cleats come with UA Clutchfit upper wraps that contain and morph to your foot so the cleat moves naturally on your foot without feeling bulky or loose. Comfort is not lost in these women’s lacrosse cleats, as they come with molded 4D foam footplates to keep the shoe tight and conformed to your foot. 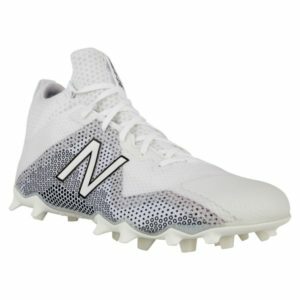 One of the more pricey lacrosse cleat options, these women’s Highlight lacrosse cleats run from $100-120, but will be worth every penny. Under Armour has cleats for all likings, so naturally they developed a snug, streamlined, low-cut women’s lacrosse cleat. 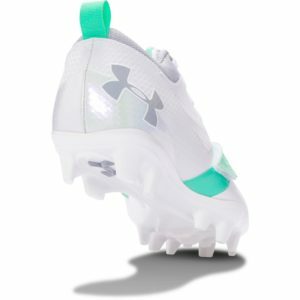 Like the Highlight lacrosse cleats, the Under Armour Finisher women’s lacrosse cleats are light and snug, almost looking thinner than other low cut cleats of other brands. The low profile of the UA finisher lax cleats allows comfort and flexibility for the speedy player that doesn’t need the extra ankle support. These Finisher lacrosse cleats are developed with CoreSpeed Chassis under the bottom of the shoe to power the natural motion of the foot to allow for unparalleled acceleration, cutting, and pivoting. They can be found for $. Nike has been in the shoe game for a while, so it’s no surprise they’re getting more involved in the production of women’s lacrosse cleats. The SpeedLax 4 women’s lacrosse cleats are designed with ergnonomic spike placement, to offer the most grip on the ground in any conditions. The dual pull fit system keeps the shoe tight and formed to your foot, with full ankle mobility as to not reduce movement. The synthetic material keeps the bottom of your foot dry while the perforated upper helps you get rid of added moisture and sweat. One of the more popular, less pricey options at about $. 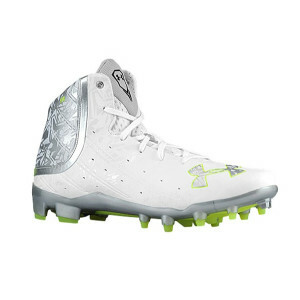 Produced alongside the Under Armour Finisher lacrosse cleats is the women’s Finisher lacrosse turf shoe. Made from synthetic leather and rubber, the turf shoe is light and breathable so your feet don’t feel like they’re melting on hot days on the turf. Created to grip, the nubs on the bottom of the lacrosse turf shoe are more squared off than rounded, giving you a little extra dig. The Finisher lacrosse turf shoes are low-tops, but still supportive and extra comfortable with the coated mesh in the midfoot. 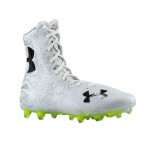 These Under Armour Finisher Women’s turf shoes can be found for around $. Lightweight performance synthetic upper encourages speed while delivering structure and support. Die-cut 4D Foam® foot bed forms to your foot for locked-in comfort while reducing cleat pressure. Anti-bacterial foot bed eliminates odors while adding shock absorption. Molded ArmourGuide® TPU outsole for stability and extra support on firm, natural surfaces. Bladed heel for in-ground stability. Conical studs at the forefoot deliver exceptional balance, comfort, and traction. Youth players are fortunate enough to buy less expensive shoes that will keep for a while, because they’re just going to grow out of them anyway! 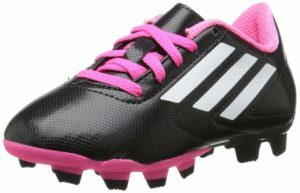 Youth girls and parents like the Adidas Performance Conquisto Firm cleat. It is the top choice between letting your youth player play in sneakers, and spending maybe too much on a cleat for your daughter to grow out of. A common ground is offered by these Adidas Firm Ground soccer cleats. They are comfortable and secure enough to offer your youth player leverage while playing, and can be worn for a variety of outdoor sports, so versatility is a definite plus. These youth lacrosse cleats are lightweight and comfortable, with synthetic materials to keep your youth player’s feet dry. Can be found for anywhere from $-$$. Getting a pair of lacrosse-specific cleats is the best possible choice you can make in order to be prepared for your season. Buying a pair of lacrosse-specific cleats is only to your advantage right now, because more and more brands are coming out with new technology that really help you take your game to the next level. All in all, the best choice in lacrosse cleats is going to be the pair you feel comfortable tearing up the field in. 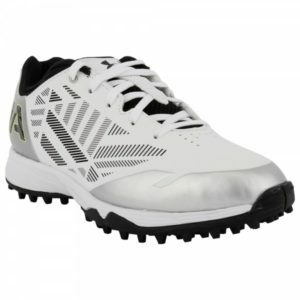 Several brands have top-notch lacrosse cleats and lacrosse turf shoes for a reasonable price. Take a look at what your teammates are playing well in, what your coach recommends, and what top-tier players are wearing. You can easily create custom lacrosse cleats online through major distributors featuring your number, logo, and team colors. Happy shopping!